Villa Tabaiba is in in a brilliant location - just a 10 minute walk takes you to the seafront and the buzz of Puerto del Carmen. Here you can find an endless number of places to eat, drink and shop till you drop. Back at the villa you will have high quality interiors, a pleasant outside area, a private swimming pool and a games room. Air conditioning/heating in the bedrooms, pool heating and WiFi are included in this 3 bedroom property. A fantastic central location - you'll be 10 minutes' walk from shops, bars and restaurants, plus the sandy beach. Great! A tiled sun terrace surrounds the private swimming pool and is dotted with sun loungers making it the perfect place to relax after having a dip in the pool. At the side of the property there is a dining table and chairs and portable BBQ which are vital ingredients for alfresco meals. This villa is accessed down a residential cul-de-sac . At the front of the property there is a private parking for 1 car and 3 steps lead from the private pathway to the front door. You can also access the pool area through a side gate. The open plan lounge/dining area is spacious and complete with quality furniture and neutral tones. There is comfortable seating, a flat screen TV and a dining table and chairs. Patio doors from this area open onto the swimming pool terrace. Next to the dining area is a contemporary kitchen fitted with shiny black and white units and a range of appliances to enable you to prepare your favourite Canarian meal. There is a utility room on the lower level next to the games room. From the living area, a staircase leads down to a lower level with games area. This is an ideal place to take a break from the sunshine and enjoy a game of table tennis. All 3 bedrooms - a double with an en suite bathroom and 2 twins - are located on the first floor. The 2 twin bedrooms have patio doors which open out onto a large shared balcony with distant sea views. All bedrooms are stylish and tastefully decorated. There is also a bathroom on this floor. The fully tiled walls and floor create a clean and fresh feel. The WC on the ground floor is located next to the kitchen. Villa Tabaiba is just 10 minutes' walk from the seafront and resort centre of Puerto del Carmen where you will find all sorts of activities from arcades to casinos. With a variety of shops, restaurants and bars there's plenty to do and see. The old town and harbour are also well worth a visit, around 20 minutes on foot. The beaches of Puerto del Carmen and Playa Chica are within walking distance. There are shops for your daily essentials within a short walk of the villa. For some serious retail therapy head to the Biosfera Shopping Centre. Alternatively, Teguise market is open on a Sunday morning and is located about 30 minutes' drive from the villa. There are hundreds of stalls to wander around selling products such as ornaments, jewellery and leather goods. There is a great choice of places to eat and drink within walking distance. In the old town you will find the harbour where restaurants sell freshly caught fish and seafood. The sandy beach of Playa Grande is the most popular in Puerto del Carmen and is a 10 minute walk from the villa. Alternatively, Playa Chica Beach near the harbour is great for diving. On the main beachfront, there is a children's swing park. Or, at the Aquarium Centre, there is mini golf and trampolines along with a small snack bar. In the old town and harbour, there is a children's play park which is conveniently surrounded by restaurants. Rancho Texas Park provides entertainment for all ages and is a short taxi ride away. Probably the most famous place in Lanzarote is the National Park of Timanfaya where you will see demonstrations of the tremendous heat that still lies below the surface. There are several tourist attractions you can visit by the late artist Cesar Manrique who was responsible for the unique building laws in Lanzarote. Tias Golf Course, on the outskirts of Puerto del Carmen, is an 18-hole course. There is also a golf course in Costa Teguise. Puerto del Carmen has a long promenade which stretches all the way to the capital of Arrecife making it perfect for hiring a bike as there are cycle lanes along it. The promenade is also good for walking with plenty of places to stop for a drink. Another nice walk is the cliff top route to Puerto Calero. If you don't fancy the walk back, there is a water taxi which runs throughout the day to and from Puerto del Carmen Harbour. Villa Tabaiba is not available to book for season as it is sold out. Take a look here at the Lanzarote villas that are currently on sale. Literally up the road from Puerto del Carmen Tias is a bustling community with bars, cafes, shops and restaurants. Try El Correos with a rustic feel, house wines and a typical tapas menu. Specialise in "pinchos" various toppings served on slices of crusty bread. Iguaden Restaurant has less formal tapas side and a restaurant. Consistantly good. Fresh bread and pastries baked on the premises try San Antonio Bakery. This was the first time I had booked with Villa Plus and my first time staying in a villa. From start to finish the whole experience was wonderful! The villa was in a great location, not too far from the restaurants and beach. A nice big supermarket was a 5 minute walk away. The welcome pack had a good assortment of stuff, good brand tea and coffee. I would definitely book with Villa Plus again. The villa was fantastic. Very clean, spacious and we had a brilliant week! The villa was very clean, presentable and not too far from all the attractions. Lovely villa with everything we needed - someone had even left us a lilo :) The table tennis and pool were good extras and the location of the villa was perfect. Cleanliness of the villa was excellent on arrival. 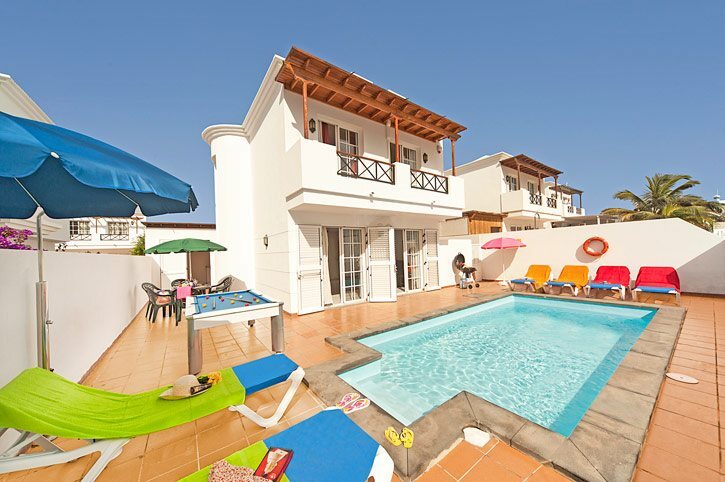 The Villa was as described and as the pictures on the website, which we were pleased about. It was cool, clean and spacious enough for my family of 4. The dishwasher was a great time saver and the showers were nice and powerful. Fantastic pool just the right size for us and our 4 and 6 year old.